M.A.F. fills the world with inspiration and invigoration. The Sun Cider we've made for you is a close second! Sun cider will be out soon! We will share our ratios and recipes! 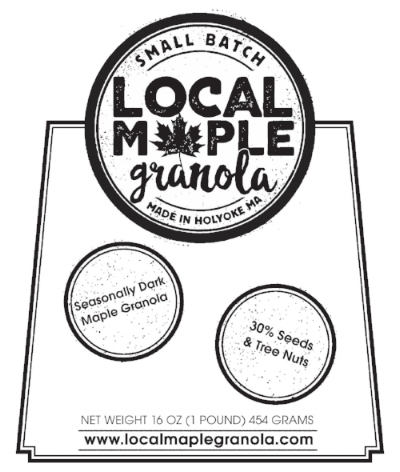 Where can I find Local Maple Granola? Massachusetts Artisan Foods is now identifying as a hybrid Micro Farm and Creator of Amazing Pantry Goods (Bakery). We grow slowly and in 2018 we strive to use ingredients from our micro farm whenever possible, and all our products will continue to highlight Bay State Organic Farms. This year we will be offering soup and tea blends using our own home grown Herbs and Vegetables as well as products from local farms. Every year more and more of the ingredients in our products will be grown by us! We’ve turned the traditional farm model of growing products and then adding value for market sales UPSIDE DOWN. We started by making grocery products everyone loves and are now increasingly featuring plants we can grow as we expand. Where to get Local Maple Granola?